The Comcast Experience has begun this year’s Holiday Spectactular at the Winter Garden in the lobby of Comcast headquarters in Philadelphia where two Analog Way Ascender 48 systems drive one of the largest 4mm LED wall installations in the world. David Niles of Niles Creative Group is responsible for the wall’s content concept and production year round since its inception and handled the project’s systems design and integration. Since its debut, The Comcast Experience has attracted the attention of Philadelphians and visitors to the city and engaged those going to and from work in the Comcast Center. 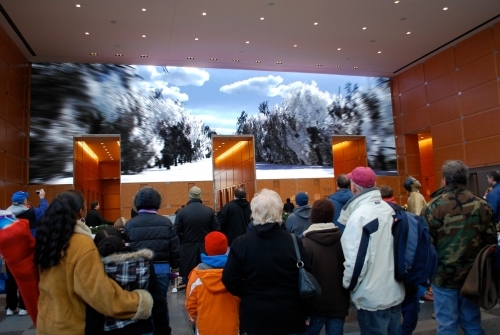 A unique LED screen fills the wall broken up by three entryways leading to the building’s elevator banks. All of the imagery displayed on the LED wall has been created by David Niles and runs 18 hours a day. When the LED wall is at rest for six hours every evening the imagery becomes an extension of the Winter Garden’s maple-paneled walls and is indistinguishable from the interior architecture. The holiday show runs from Thanksgiving to January 2, 2018 playing seven days a week on the hour. The 15-minute, family-oriented display features a musical overture, iceskating, dance numbers and a fly over the city. The lobby is decorated with animatronic snowmen that blow snow on the crowds. 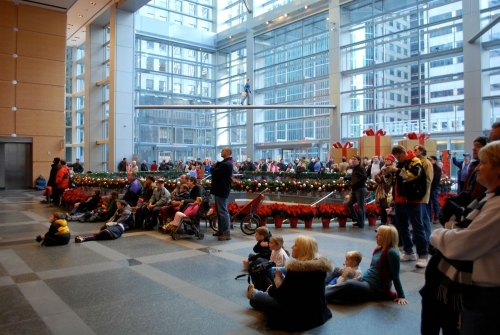 “People pack the lobby to see the show,” Niles reports. During the rest of the year Niles’s live-action content highlights “ordinary people doing extraordinary things” produced in a quirky style he calls “a bit like a cartoon in The New Yorker.” Life-size actors push and pull panels to reveal hidden things, ride across the wall on a 50-foot pencil like a rocket ship and appear behind dozens of windows doing interesting things. Weekends feature themed shows such as American Snapshot, which Niles likens to a coffee table photography book about the US, or a portrait of Frank Lloyd Wright’s Falling Water house in Pennsylvania. Special content is displayed, too – when Pope Francis visited Philadelphia Niles took viewers on a tour of Rome. Niles uses an array of ultra-high resolution cameras to capture footage for the LED wall’s amazing native resolution of 12 million pixels. Content is played out based on a series of algorithms Niles developed based on the time of day and lobby traffic. “It follows a theatrical arc so visitors and employees don’t see repeats apart from evergreen content like the giant clock,” says Niles. Photo: the 10 million pixel computer generated Philadelphia flyover sequence. Analog Way became involved with The Comcast Experience when equipment was refreshed two years ago. At that time an entire rack of processing gear was replaced by two Analog Way Ascender 48 (LiveCore) multi-screen processors, which manage the multiple-output system as one seamless canvas. The Ascenders are linked together to provide full access to 24 inputs and 8 outputs during the LED wall’s 24/7 operation. With the LED wall online 24/7 it was imperative that any new system offer the utmost in dependability. “Comcast treats the display as if it were a broadcast; it’s the face of Comcast,” Niles explains. Miami-based Smart Monkeys, Inc. has been associated with The Comcast Experience since its inception programming the Medialon show control for the display. When the equipment was refreshed Alan Anderson programmed Medialon to interface with Ascender to put up PIPs, perform dissolves and switch inputs as required. “The Ascender 48s are at the heart of the screen management. Their role is fundamental to how the LED wall represents the content and creative vision. Both the performance and reliability of the Ascender 48s made them the unequivocal choice,” comments Anderson. Analog Way provided on-site support to customize the equipment installation and liaise with programming to ensure a flawless transition, Lubaszka recalls. “Everyone worked within a very tight timeframe so the system was down only during the overnight maintenance window,” he reports. It’s not too late to catch The Comcast Experience holiday show, but if you miss it there will be plenty of captivating displays to watch all year round.